Many years ago a little boy with curly hair was carried on the shoulders of his friends for winning them a gold medal for singing in an inter-school competition. The lads of Koralawella were singing praise for little Albert for the fame he had brought them and the sea side village of Koralawella, Moratuwa, little knowing that in the years to come he would entice the nation with his melodious voice. 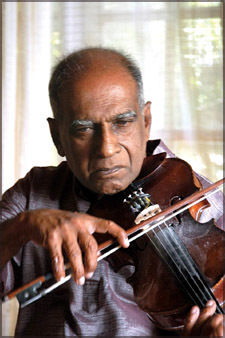 Albert Perera not only changed his name into W. D. Amaradeva but also changed country's musical landscape with a unique synthesis of classical, folk and contemporary musical traditions. He has received many awards and felicitation including the Ramon Magsaysay award (2001) from the Philippines which is considered the Noble Prize of Asia, the Padmasri (2002) Award from India which is the highest civilian honour and the coveted French Chevalier (2003) and notably he still remains the most popular artist as confirmed by Nielsen Media Research findings. Maestro Amaradeva turned eighty on the fifth of December. Since strumming the violin at the tender age of seven Amaradeva has had his presence felt in ballet, cinema, television, radio and public performances that touch fans with a magical effect and keeps them spellbound. There may only be a few on this island who have not been touched by the magic of his melodious voice, musical compositions and violin recitals. This magical effect had to be captured into maestro Amaradeva's biography for the BBC world service Sandeshaya programme. As the maestro's soul mate Professor Carlo Fonseka says 'Amaradeva's biography is the story of modern Sinhala music'. I am reminded that radio (sound) is not the medium to deal with such complex theme. I leave the complex and scholarly analysis to musicologist and biographers and set about to the task of capturing a few snapshots in sound of this illustrious journey. On a Sunday morning I am seated in front of this great musician at his residence on the Naladaramaya road in Nawinna. Many of his contemporaries say that Amaradeva remembers only music and forgets everything else. I am not sure what everything else means but I was convinced in our first meeting that Amaradeva certainly forgets one thing. As the poet Rathnasri Wijesinha put it to me 'Amaradeva forgets that he is Amaradeva'. He made me forget that I was beside a great musician whom I have revered all my life. The great maestro is quick to put me at ease and invites me to his world. He sits with the harmonium and plays a tune and tries to explain the difference between lyrics and poetry. With his soft voice he loudly proposes that the melody in a song merits prominence over lyrics. Maestro Amaradeva lives in a universe of melodies sound that generates rainbows of aesthetical thought. He kindly agreed to share his life and thoughts for a radio programme to be broadcast over the BBC World Service, Sinhala language programme, Sandeshaya. With the waves of the Indian Ocean smoothly lapping in the background a few of us are seated around him at the Galle Face Hotel eager to have a glimpse into his universe. Making an introduction Professor K. N. O. Dharmadasa, editor of the Sinhala encyclopedia says that there is not a single sphere of Sinhala art and culture that has not been touched by the influence of Amaradeva. Professor Dharmadasa points out to the uniqueness of so many distinguished attributes within a single individual. The mood for a scholarly discussion is set. Amaradeva a master of performing changes the atmosphere at once. "It's only now that I realized that I was turning 80 on the 5th of December. I never have time to think of my age because I am always occupied'. The entire room fills with a roar of laughter. Is wasteful and ridiculous excess". Professor Fonseka is certain that speaking of Amaradeva's greatness is a ridiculous excess. Isn't he correct? Doesn't any kind of appreciation become redundant with this small made man who has reached the pinnacle of fame? Is there anything new to say? But then why is this learned medical professor who is no stranger to music sitting with us? As the conversation roles on Amaradeva himself proves that discussing his work is no excess in any way. Amaradeva's patient and untiring struggle with music and other related forms of art spanning many decades and still in progress will remain a great ocean that could not be explored in its fullness. Each time you listen to a song of his or refer to his writings a new dimension emerges. There is always something new. The maestro takes us through his journey in the world of music as well as his thinking that has guided him all throughout. Amaradeva shares his secret of warming so many hearts with his music. "I do music because I really enjoy it and it's the fulfilment that I gain through this experience that I share with my fans". He tells us how he embarked on a journey to explore the rhythm of folk music and the rewards reaped. He not only transformed folk melodies into musical creations with superior aesthetic significance. He also found his wife Wimala, who even today excells with her ability of singing folk songs. As Amaradeva takes us to the depths of his aesthetic universe the musicologist in him emerges. "Melodies lines follow the natural inflictions of language speech patterns. Although not always conscious of this that's what I practised", says Amaradeva providing an insight into how he has been able to capture the essence of culture. As the sun sets in to the Indian Ocean we slowly wind up our discussion. he sings Qawmee Salaam, the Maldivian national anthem, a musical composition of the maestro. Fully convinced that Amaradeva's story is the story of Sinhala music and culture, I am set to meet hundreds of contemporaries to put together the Amaradeva biography. I am at No. 5 of the street named by the person I am meeting, Dr. Lester James Peries. He tells me that Amaradeva's voice is the greatest musical instrument we have in this country. Musician Lionel Algama who has collaborated with Amaradeva on many occasions laments that Amaradeva does not practise the violin enough and now he is not the best violinist we have but the best violinist we have had. Violinist DD Gunasena tells me what the maestro does when he forgets a line or two while performing. Professor D. P. M. Weerakody of the Peradeniya University tells me of many musical compositions of Amaradeva which many of us have not had a chance to listen. Professor Wimal Dissanayaka speaking from Hawaii explains why a musician like Amaradeva from the southern hemisphere could not make his presence sufficiently felt in the international arena. Tissa Abeysekara tells me how his discussions in the SLBC canteen with Amaradeva were a source of inspiration. Nanda Malini reflects with deep gratitude how Amaradeva brought her into the studios holding her hand when she was a little girl of twelve to sing her first song. Priyan Weerapuli, a young musician inspired by seeing Amaradeva on a US tour composes a song. As the journey continues it seems that there is nothing Sinhala that's not touched by the charm of Amaradeva. As late professor Hemapala Wijewardana said 'While pundits wage verbal battles regarding what Sinhala music ought to be he has demonstrated what it could be' This remarkable journey will be narrated by Maestro Amaradeva and many others on the 'Himaw Arana' programme broadcast over the BBC Sandeshaya programme on Sundays at 9.15 PM (Sri Lanka time) over the National Service of the SLBC and also by visiting the bbcsinhala.com website.